Blog from South East Coast, New South Wales | Helen & Andy Travel Oz! 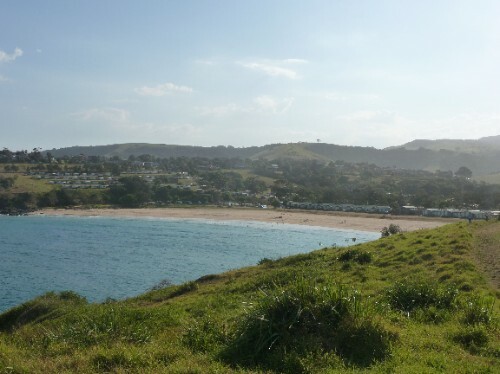 The coastal town we found was called Kiama, it’s south of Wollongong (where Taylor sky-dived on his last visit). Kiama seems famous for two things, one much bigger than the other, but they’re both Blowholes!! We found a campsite on the beach although it was a little chilly there so we didn’t swim, wimps! It was walking distance to town though so we went up to explore the larger Blowhole. The pictures should show what I’m going on about but basically where the sea meets the rock face, it has worn a cavity into the side of it, and a tunnel from this cavity leads up to the surface of the rock. When the waves come in (and coming from the right direction helps) it flows into the cavity and air is compressed in a chamber at the rear of the cavity. When the waves subside the air is released through the tunnel taking with it the trapped water and there is a huge whoomp sound too! Well that’s what the information board said, but what you see is every now and then a huge shoot of water spurting up from the gap with a great noise and then a pretty rainbow where the sun pours through the remaining mist. Sounds a little strange but entertained us, although we are quite simple! Further down the coast there is a much smaller version, but you can get to it and get soaked if you want and at the right times the spurts can be just as big, see size doesn’t matter! We went to Wollongong for the day shopping and walking the beach, and realised we had been in Oz about a month and had only gotten about a hundred miles south of Sydney! So we have had a few moves since then to get us along our journey. Next stop was Jervis Bay, it was a must because its known for its dolphin and whale watching as well as being a beautiful harbour town in a stunning bay. Stayed again on a beachside which meant we got a lovely cooling sea breeze, perfect seeing as though New South Wales was literally the hottest place on earth that weekend with temperatures reaching about 48degrees! We booked ourselves a dolphin watching cruise and spent about 4 hours out at sea, although that was very windy! Views of the bay were brilliant and couldn’t have been seen without the cruise so it was well worth it, and we even saw a nursery group of dolphins including a baby sticking close by its mothers side, very cute but unfortunately too quick for the camera! After that though the weather turned, with the next day being overcast and wet. The problem with staying on the coast is if the weathers not so good you don’t have a view so we moved on. What we didn’t realise was the weather was due to stay with us for the week! So we headed south to another bay called Batemans Bay, again another harbour village and another campsite on the beach, well what we could see of it through the rain and mist! It was a stunning site with great wildlife and lovely town, but the rain put a stop to our sightseeing, not because we didn’t want to get wet, but we couldn’t see much! Lazy days occurred with many chocolate biscuits eaten! There are however many plus sides to our current overcast rainy weather; we’ve managed to get quite a bit further south in a short space of time so we’ll soon be leaving New South Wales, we aren’t woken up at stupid-o’clock with Jerry like an oven, travelling is a lot more comfortable, we can play computer games (very sad when you’re in a country as beautiful as this), and most importantly the rivers can swell and Victoria can hopefully get some relief from the heat to help them with their fight against the flames. The whole country has gotten behind the relief work so quickly, it is amazing, even supermarkets are donating their days profits to the cause. Such a strange country though, bush fires in one state and floods in another, crazy!